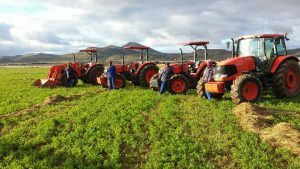 The oranges at William Copeman’s Cradock farm ‘Rooiberg’, which he says have ‘revolutionised’ his business are not the fruit (he does not have orange trees) – they are his fleet of Kubota tractors! 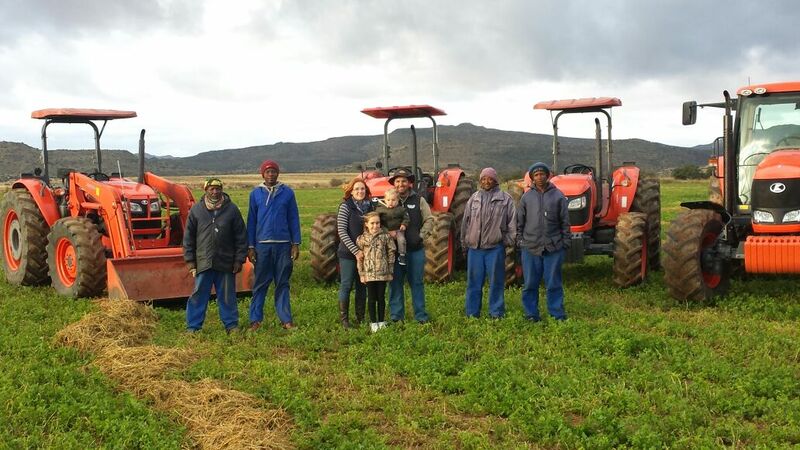 Kubota with the Copeman Family in Cradock. Left to Right: Vanessa, Rebecca, Mark and William Copeman. 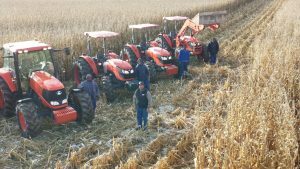 “I changed from a well-known brand to Kubota about four years ago because of price and the wet plate clutch feature and I have never looked back. 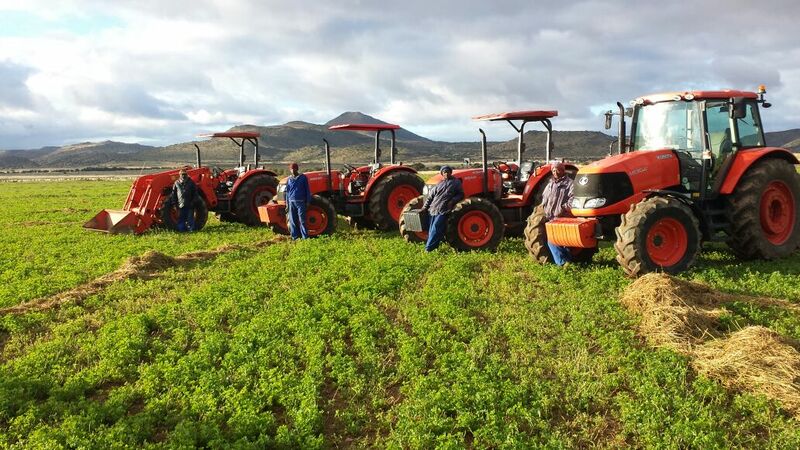 The general efficiency of these tractors and the backup service that I get from the Cradock Kubota dealer, Fatty’s Mechanical Repairs, has made a real difference to my operation,” says Copeman. There are many features that make Kubota great, none more so than the unique wet plate clutch feature that Copeman talks about. Kubota transmissions incorporate a 4-speed conventional all-syncromesh gear set with a 2-speed range option and an optional creeper-gear set. The driver selects the ground speed using a normal gear lever but Kubota engineers have added a system of wet plate clutches to engage the output shafts to the wheels and PTO systems. This eliminates the normal dry plate clutch and allows for the tractor to function much more effectively. “This is ground-breaking engineering which is not found in other makes of tractor,” says Deon Engelke Kubota brand manager at Smith Power Equipment (SPE) distributors of Kubota in southern Africa. 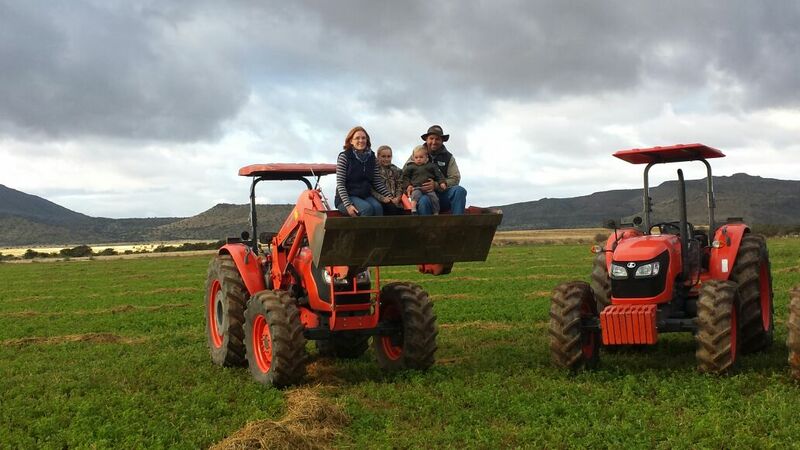 Copeman has two Kubota M8540s, a Kubota M9540 and, his most recent purchase, a Kubota M130X. “I have been impressed with the power to weight ratio and the fuel efficiency of the smaller tractors and will no doubt experience the same with the M130X,” he says. Based on global reports and the fact that the M130X is one of Kubota’s best sellers worldwide, Copeman will not be disappointed. With increased horsepower, enhanced management control and exceptional versatility, the Kubota M130X can comfortably take on the toughest of jobs. This 96.9kW workhorse has a 4 cylinder V6108 Common Rail direct injection engine with turbocharger and intercooler. It has 16 forward and 16 reverse gears with a hydraulic multi-plate wet disc clutch (discussed above). Over and above this, the M130X boasts some unusual and important features including rounded over-sized fenders made from ultra-durable FRP fibreglass, which provide increased protection from mud, dirt, dust and other flying debris while giving the tractor a more streamlined appearance. The wide, unobstructed view from the cab is another attention grabber in the M130X. Kubota has maximised the glass area around the frameless doors and has also concealed the pillars. A bottom-hinged wind-shield wiper enhances visibility by wiping the lower glass area right up to the front tyres. Copeman farms maize, lucerne, Angora goats and sheep. This article was featured in the FarmTech – July August 2017. 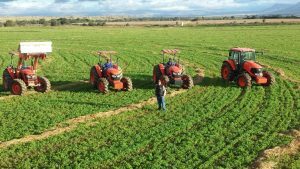 This article was featured in the ProAgri – Aug 2017.